In 1868, three-ply commercial yarns were being produced by woolen mills around Germantown, Pennsylvania, and shipped to the Navajo reservation for use in weavings. By 1870, a four-ply yarn became the mainstay, which produced a very consistent even weave and came in a variety of bright aniline colors. These colorful, tight, well-composed Navajo textiles became known collectively as Germantown blankets. The majority of these Germantown weavings were composed of four-ply commercial wool yarn, which often used a cotton warp as their foundation, though the Ganado trading post owner John Lorenzo Hubbell discouraged the practice of cotton warps as they did not wear as well as those with a wool warp. 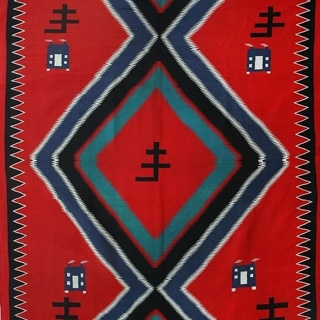 Navajo Germantown 3rd Phase Chief's Blanket with Spider Woman Crosses, Richard Avedon Estate c. 1890s, 61" x 77"
Navajo Germantown Blanket with Whirling Logs c. 1890s, 72.5" x 54.25"
Navajo Germantown Blanket, c. 1890, 51" x 35"
Navajo Germantown Blanket, c. 1890, 64" x 46.5"
Navajo Germantown Rug, c. 1890, 89" x 79"
Navajo Germantown Sampler, c. 1890, 20.5" x 20.5"
Navajo Germantown Textile, c. 1900, 48" x 29"